Christmas shopping for the crafty person in your life made easy! Need a Christmas present with a difference? Why not purchase a module (or 2 or 3!) for someone crafty in your life? We have 3 modules available and they would make a fabulous, fun gift that you don't even have to gift wrap! Buy any of the modules as a gift for someone and we will send you a graphic that you can print out to pop in a card or send to them via email or messenger. All you have to do is contact us via this blog after you have made your purchase/s to let us know. You will find more information about the 3 self-paced modules here. We are more than happy to help you get your Christmas shopping done! Why not buy the modules for yourself .... or drop hints to your family! Module 3 is here ..... finally! Hi Everyone. Well life has certainly thrown both of us a few curve balls this year which has meant that we have not been able to release module 3 when and as we would have liked. Watch this little message to find out the latest Stamp In Confidence news. As you just heard Module 3 will be released at the beginning of September and will now be all about colouring images. 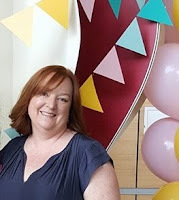 Lou is going to let you in on tips and tricks to get you colouring with confidence using Watercolour Pencils, Aqua Painter and ink and Stampin' Blends. By following a simple formula, you will learn to add shade and depth for more realistic looking images. Pop on over to our Online Class Module page to find out more information and purchasing details. Hope to see you in Module Three. Have you checked out Module 1 & 2 yet? Content for Modules 1 & 2 are all available now. Participants have given us great feedback. You read some of their testimonials here. * Gifts for new recruits/team members - let us do the training for you! Module 3 will be released later in the year. Head over to our Online Module page to find all the information you need. Module 2 Content will be released this weekend - have you registered yet? Module 2 content is filmed, prepped and ready to go. We are both so excited about our online class modules and this module is no exception. For only $6 AUD you get access to the private FaceBook group where you will see 4 videos, each with written documents as support. There are more than 10 projects (exclusive to Stamp In Confidence) with so many tips, tricks and a wealth of information. You can find payment information on our Online Class Module Page. Click the PayPal link for the module/s you would like and follow the prompts. When you have received a payment receipt email from Paypal enter the private FaceBook page via the link on the Online Class Module page. Our modules are perfect for beginner stampers as well as demonstrators who are interested in how to teach beginners. 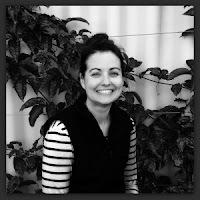 Check out all of the information on the Online Class Module Page. We look forward to seeing you in the class groups. We've had great feedback from participants in Module One - Stamping Basics. You can read some of the testimonials here. Module One can be purchased from the Online Class Module page here. The fabulous thing is that these modules can be done in the comfort of your own home at a time that suits you. Just follow the instructions for payment and joining the group and you will have access to the content. 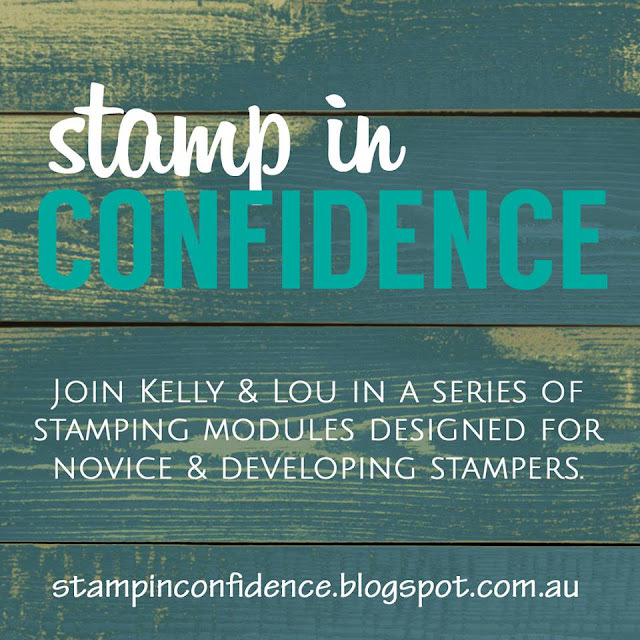 When we first talked about the concept that became Stamp In Confidence we really just had beginner and novice stampers in mind. 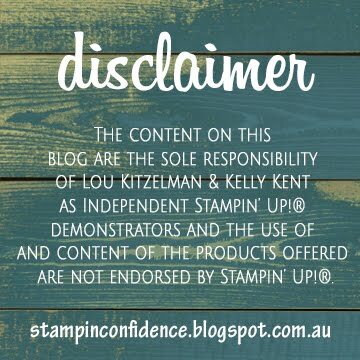 It wasn't until some experienced stampers and Stampin' Up! Demonstrators completed Module One that we realised that the content was also a fabulous resource for Demonstrators to learn how to teach the basics. It is one thing to be able to do something but it is a completely different skill to be able to break it down and go back to basics. We have a structured program that will help you in your own classes. The videos are almost like training resources for you. The written documents can be used in your classes - but there is a licencing fee. Contact us to learn more about using our resources in your classes. Module Two registration is now open. Register now for Module Two. You will have access to the Product and Materials list so you can get ready to create along with us and the video and other written content will be available to access from Mid April. One more sleep til our first video launches! Yep! One more sleep until Video 1 of Module 1 is launched. We kick off at 6 pm Queensland time (AEST), Saturday March 17. Check out out the launch time in your area here. We've been working really hard on this module and have 6 videos - 4 information and 2 tutorials - plus written material to support them. So much is packed into this module - all for $6 AUD. Plus you get to interact with others learning the same content as you in a private Facebook group. In Module One we share with you the basic products, materials and skills you need for basic stamping and card making. This is just like a class - except you get to watch it in the comfort of your own home at a time that suits you. You can create along with us, pause and rewatch the videos. Oh and did we mention that this online class module is packed with content? If you haven't registered yet, head over to the Online Class Modules page. You'll find all the information you need here so you can be registered and ready to watch and learn. We hope to see you in the Stamp In Confidence Module One private Facebook group soon where you will be able to access all of the content as it is released. In no time you will be able to Stamp In Confidence. Filming has begun! Video and written content will be uploaded from this weekend so register now! This is an excellent online class, perfect for beginner or novice stampers. You'll be stamping in confidence in no time! We strip it right back to basics for you, helping you to build skills and choose products so you can create cards you can be proud of. You will find all of the information you need about Module One content and registration here.